Cycling .... It has to be the ultimate accessory sport! There's always something new coming along and here we take a quick look at the latest from Bont, Supacaz and Hiplock. Although it’s an entry-level shoe the Bont Riot offers a whole lot of bang for the buck! That and the fact at first glance they could easily be mistaken for the company’s top model, the Helix. High-end Bont shoes are renowned for their world-class performance and anatomical power transfer platform and this model is no different. The Bont Riot delivers competition-level fit and construction with a micro-adjustable buckle and secure Velcro retention system. The shoes feature fibreglass construction with an anti-stretch Microfibre upper, a stack height of 4.8mm and replaceable sole guards. The fit is customisable via a fully heat moldable chassis that utilises epoxy thermoset fibreglass. Closure is via a Velcro strap and micro-adjustable buckle. Colour options available are White/Black or Black/White. The shoes weigh 295g each in size 42. Sockdoping is real, and if you ever need any proof of that all you’d need to do is check out the Supacaz website or social channels. 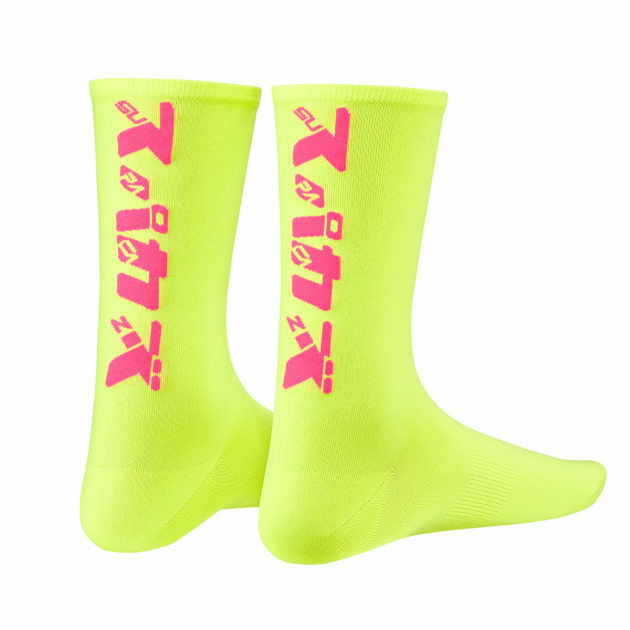 The Californian-based accessory company are famous for their bright bling, and these socks are further proof of that. Known as ‘Supasox’, these ‘woven pieces of art’ are not only pleasing to the eye, but also have superior performance attributes. Supacaz socks are smooth in texture, fit snugly,and are extremely breathable. The wicking technology keeps your feet dry and cool in all conditions. They are available in a range of colours and styles from your local bike shop or online. Bike locks and road bikes don’t tend to mix. Think security and you may imagine a weighty padlock and potentially frame-damaging chain. Well, what used to be cumbersome and clunky is now lightweight and even wearable—well that’s the case with some of the models from Hiplok . For the past few months Bicycling Australia have been field testing two of the zip models from the UK-based company: the Z LOK is available in a keyed and a combination locking version. Security-wise these locks are not designed to be a substitute for an old-school heavy duty chain and padlock, however they do feature a steel core with heavy duty plastic coating. But for quick trips away from the bike they provide a quality and trustworthy locking solution, are a great visual deterrent, and offer peace of mind. Effectively an ultra-heavy duty reusable zip tie, the Z LOK is lightweight, easy to carry won’t damage your precious paintwork and is an affordable bike security solution. The lock easily and comfortably fits into a rear jersey pocket and comes highly recommended!